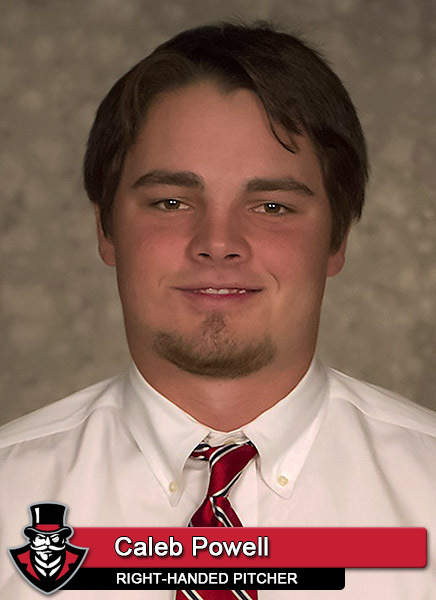 Carbondale, IL – Junior second baseman Garrett Copeland went 5-for-5 and Austin Peay State University’s baseball team pounded out a season-high 22 hits in a 16-10 nonconference victory against Southern Illinois, Tuesday night, at Itchy Jones Stadium. Austin Peay (14-9) left little doubt whether it brought its bats on the road as Copeland opened the game with a triple. Center fielder Patrick Massoni drove in the game’s first run with a sacrifice fly and was promptly followed by third baseman Ridge Smith‘s double. Two batters later, designated hitter Alex Robles drove in the second run with another sacrifice fly. The Govs doubled their lead in the second, again sending six men to the plate. Copeland supplied the third run with a RBI single and Massoni followed with a run-scoring fielder’s choice, pushing the APSU lead to 4-0. 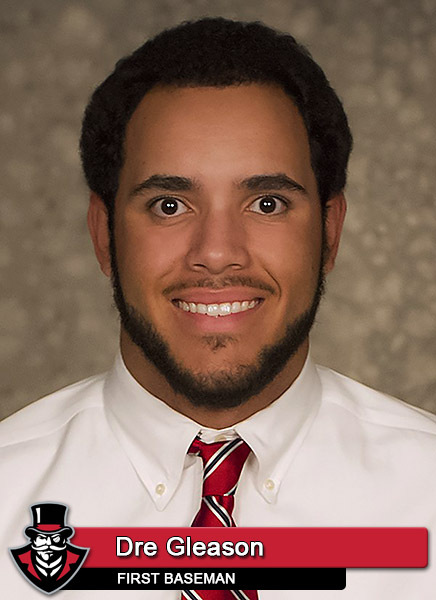 Southern Illinois (14-9-1) got a run back off the Govs bullpen in the third inning as center fielder Dyllin Mucha reached on a leadoff single. 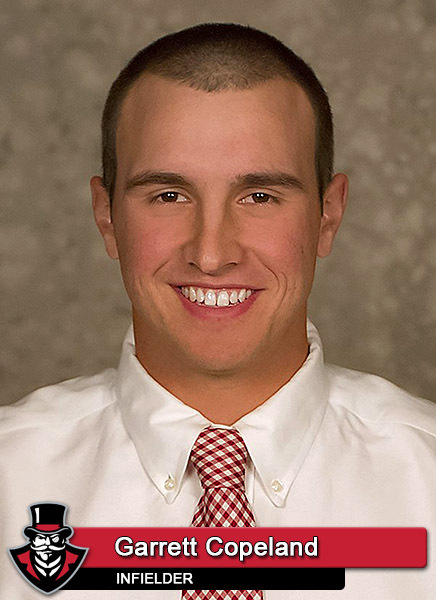 Left fielder Greg Lambert drove in the run with a two-out double, cutting the Govs lead to 4-1. Austin Peay responded by scoring in each of the next three innings. Copeland kept up the hit parade with a RBI single in the fourth and a solo home run in the sixth. In between, the Salukis defense committed an error that helped the Govs score two runs. After six innings, Austin Peay held an 8-3 lead. The game turned messy in the eighth as the two teams combined for 14 runs on 12 hits in the frame. 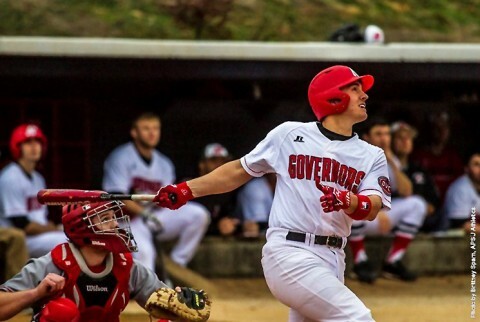 The Govs got the better part of the deal when they send 14 men to the plate for eight runs. Southern Illinois was able to get six runs back but could not close the gap further. Austin Peay starter Caleb Powell (3-1) won his third straight start with two scoreless innings, holding SIU to three hits. The Govs used six pitchers out of the bullpen after Powell departed. Copeland’s 5-for-5 outing saw him reach base in all six plate appearances as he added walk in the eighth. He fell a double shy of the cycle with three singles, a triple and a home run. It was the first 5-for-5 by a Govs hitter since Ridge Smith turned the trick at Eastern Kentucky last season. First baseman Dre Gleason added four hits and Smith had three hits. Eleven Austin Peay hitters recorded a hit in the contest and eight finished with at least one RBI. SIU starter Bryce Sablotny (2-2) allowed seven runs on 10 hits in five innings and was tagged for the loss. Lambert led the Salukis offense with a 3-for-4, three RBI performance. Designated hitter Braden Mosley went 2-for-5 with three RBI. Austin Peay continues its five-game road trip when it meets Tennessee Tech in a three-game Ohio Valley Conference series this weekend. The conference set begins with a 6:00pm, Friday contest in Cookeville, Tennessee.